WOOSTER, Ohio — Parker Pennington, U.S. National Champion at four different levels, will be bringing some of his talented friends to Wooster, Ohio for a figure skating and dance show spectacular. Pennington, a resident of Westlake, Ohio, will be debuting his new show, Skate Dance Dream presents “The Dream Show” on Saturday, August 6, 2011, at 7 p.m. at Alice Noble Arena in Wooster, Ohio. The show aims to inspire skaters and dancers throughout the Cleveland area and beyond, by giving them the chance to perform with the Stars. With a unique blend of the two arts, skating and dancing, the show certainly promises to surprise and excite with jumps, spins, tricks and much more. The most important piece for Pennington is to make a difference for all the local skaters and dancers in route to chasing their dreams, by giving them the platform to both perform and learn from their idols. “We feel like if every child is given the opportunity to skate or dance with the stars and get to spend time learning and being around them, it can only enhance their experience and love for what they do. At the end of the day, I want to be able to create a memory for them that will be everlasting.” says Pennington. Pennington highlights that performing in the show Scott Hamilton & Friends with his idol Scott Hamilton, undoubtedly kept him inspired and pushed him towards furthering his skating goals. Skate Dance Dream presents “The Dream Show” is in many ways, a dream come true for Pennington. After producing “Skate for Life” for the Muscular Dystrophy Association in both Connecticut and Ohio, he knew that his heart was set on encouraging the next generation of skating and dancing talent through his productions. He notes seeing the children’s faces light up being on the same ice as their idols was the icing on the cake that cemented his dream vision. He first conceived the concept back in 2009 and he is excited that the dream project is now coming to fruition. “I am beyond excited to bring this show to Alice Noble Arena. The Wooster Figure Skating Club is such a deserving club to be able to host this and I know their enthusiasm will ignite the show,” says Pennington. The show is set around the theme of inspiration, while holding a constant goal of pushing innovation to the fullest. One aspect that Pennington particularly hopes is successful is the outreach to the local skating and dancing communities, by bringing the Stars right to their town. Our philanthropic efforts also offer the chance for clubs within a region of where our shows take place, to receive a grant award for their programs. The show’s incentives range from winning private lessons with the Stars to pizza party with the Stars for the younger kids. 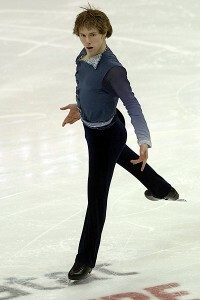 The show certainly promises to bring a different spin to the sport of figure skating. Teaming with Riedell Skates, they will be raffling off a pair of new custom made boots and blades. Additionally, regional skaters and dancers as well can come tryout for a solo or group act, showcasing their skills at the auditions on Saturday, June 25, 2011, at The Cleveland Skating Club from 12-4 p.m. or they can submit a video through www.SkateDanceDream.com until July 1, 2011. The show boasts a strong cast including skaters, Richard Dornbush, U.S. National Silver medalist, Lynn Kriengkrairut and Logan Giulietti-Schmitt, Skate America competitors and Pennington. Also performing will be Jessica King and Gev Manoukian, both Top 10 finalist on Fox’s “So You Think You Can Dance.” More national and world class skating and dancing stars will be added to the cast, so please check out www.SkateDanceDream.com for updates. Cast is subject to change. With the show drawing closer, Pennington encourages all skaters and dancers of all ages and levels to participate. The registration deadline is July 1, 2011. Skaters and dancers from across the U.S. are also welcome to join! Tickets on sale now: $10 General Admission, $25 On-Ice seating and $50 Front Row. Visit http://thedreamshow.eventbrite.com to order your tickets! For more information or to register, please visit the show website http://www.SkateDanceDream.com. Want Pennington to bring SKATE DANCE DREAM to your rink or area? Contact him and tell him why you think the show should come to your town.